TransGainer, an audio plug-in suitable for a wide range of professional music production uses, implements an audio signal envelope adjustment algorithm that reacts on transients rather than on a signal’s loudness level. This algorithm allows you to adjust volume of attack and sustain stages of any sounds you use it on. TransGainer was designed in a way to be suitable for all possible sound sources – be it individual tracks or full mixes. 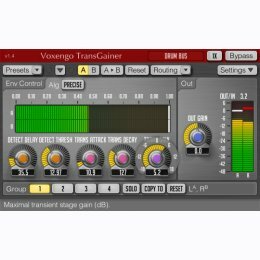 In many cases TransGainer can be used in place of gate and expander plug-ins while delivering a better sound and offering an easier control. Beside that, TransGainer can be used for audio recording restoration/re-mastering purposes and reverb tail modifications with excellent results. 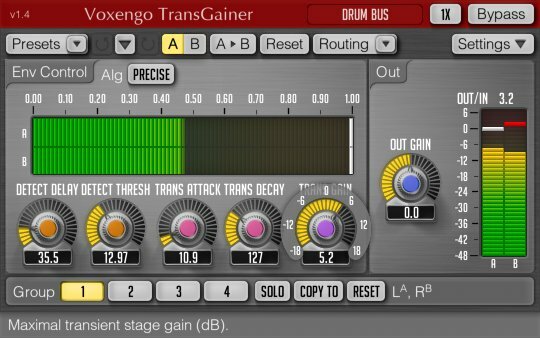 TransGainer allows you to specify positive or negative gain adjustment for a sound’s transient stage. You can also choose an expected average time between transients and transient threshold level so that the algorithm delivers you the most precise results possible. With the help of TransGainer you can pass the border from good to excellent audio recordings.